Squash is a ball sport played by two (singles) or four players (doubles squash) in a four-walled court with a small, hollow rubber ball. The players must alternate in striking the ball with their racquet and hit the ball onto the playable surfaces of the four walls of the court. The game was formerly called squash rackets, a reference to the "squashable" soft ball used in the game (compared with the harder ball used in its sister game rackets). The governing body of Squash, the World Squash Federation (WSF) is recognised by the International Olympic Committee (IOC), but the sport is not part of the Olympic Games, despite a number of applications. Supporters continue to lobby for its incorporation in a future Olympic program. The use of stringed rackets is shared with real tennis, which dates from the late sixteenth century, though is more directly descended from the game of rackets from England. In "rackets", instead of hitting over a net as in sports such as tennis, players hit a squeezable ball against walls. Squash was invented in Harrow School out of the older game rackets around 1830 before the game spread to other schools, eventually becoming an international sport. The first courts built at this school were rather dangerous because they were near water pipes, buttresses, chimneys, and ledges. The school soon built four outside courts. Natural rubber was the material of choice for the ball. Students modified their rackets to have a smaller reach to play in these cramped conditions. The rackets have changed in a similar way to those used in tennis. Squash rackets used to be made out of laminated timber. In the 1980s, construction shifted to lighter materials (such as aluminium and graphite) with small additions of components like Kevlar, boron and titanium. Natural "gut" strings were also replaced with synthetic strings. In the 19th century the game increased in popularity with various schools, clubs and even private citizens building squash courts, but with no set dimensions. The first squash court in North America appeared at St. Paul's School in Concord, New Hampshire in 1884. In 1904 in Philadelphia, Pennsylvania, the earliest national association of squash in the world was formed as the United States Squash rackets Association, (USSRA), now known as U.S. Squash. In April 1907 the Tennis, rackets & Fives Association set up a sub committee to set standards for squash. Then the sport soon formed, combining the three sports together called “Squash”. In 1912, the RMS Titanic had a squash court in first class. The 1st-Class Squash Court was situated on G-Deck and the Spectators Viewing Gallery was on the deck above on F-Deck. To use the Court cost 50 cents in 1912. Passengers could use the court for 1 hour unless others were waiting. It was not until 1923 that the Royal Automobile Club hosted a meeting to further discuss the rules and regulations and another five years elapsed before the Squash rackets Association was formed to set standards for squash in Great Britain. Standard rackets are governed by the rules of the game. Traditionally they were made of laminated wood (typically ash), with a small strung area using natural gut strings. After a rule change in the mid-1980s, they are now almost always made of composite materials or metals (graphite, Kevlar, titanium, boron) with synthetic strings. Modern rackets have maximum dimensions of 686 mm (27.0 in) long and 215 mm (8.5 in) wide, with a maximum strung area of 500 square centimetres (77.5 sq in). The permitted maximum weight is 255 grams (9.0 oz), but most have a weight between 90 and 150 grams (3–5.3 oz.). Some ball manufacturers such as Dunlop use a different method of grading balls based on experience. They still have the equivalent dot rating, but are named to help choose a ball that is appropriate for one's skill level. The four different ball types are Intro (Blue dot, 140% of Pro bounce), Progress (Red dot, 120% of Pro bounce), Competition (single yellow dot, 110% of Pro bounce) and Pro (double yellow dot). The "double-yellow dot" ball, introduced in 2000, is the competition standard, replacing the earlier "yellow-dot" ball. There is also an "orange dot" ball for use at high altitudes. Players wear comfortable sports clothing. In competition, men usually wear shorts and a T-shirt, tank top or a polo shirt. Women normally wear a skirt or skort and a T-shirt or a tank top, or a sports dress. The National Institutes of Health recommends wearing goggles with polycarbonate lenses. Many squash venues mandate the use of eye protection and some association rules require that all juniors and doubles players must wear eye protection. The glass show court used at the 2011 US Open Squash Championships hosted by Drexel University at the Daskalakis Athletic Center. Squash Court Diagonals: 11665 mm plus or minus 25 mm. There are four walls to a squash court. The front wall, on which three parallel lines are marked, has the largest playing surface, whilst the back wall, which typically contains the entrance to the court, has the smallest. The out line runs along the top of the front wall, descending along the side walls to the back wall. There are no other markings on the side or back walls. Shots struck above or touching the out line, on any wall, are out. The bottom line of the front wall marks the top of the 'tin', a half metre-high metal area which if struck means that the ball is out. In this way the tin can be seen as analogous to the net in other racket sports such as tennis. The middle line of the front wall is the service line and is only relevant during serves. The players spin a racket to decide who serves first. This player starts the first rally by electing to serve from either the left or right service box. For a legal serve, one of the server's feet must be in the service box, not touching any part of the service box lines, as the player strikes the ball. After being struck by the racket, the ball must strike the front wall above the service line and below the out line and land in the opposite back quarter court. The receiving player can choose to volley a serve after it has hit the front wall. If the server wins the point, the two players switch sides for the following point. After the serve, the players take turns hitting the ball against the front wall, above the tin and below the out line. The ball may strike the side or back walls at any time, as long as it hits below the out line. It must not hit the floor after hitting the racket and before hitting the front wall. A ball landing on either the out line or the line along the top of the tin is considered to be out. After the ball hits the front wall, it is allowed to bounce once on the floor (and any number of times against the side or back walls) before a player must return it. Players may move anywhere around the court but accidental or deliberate obstruction of the other player's movements is forbidden and could result in a let or a stroke. Players typically return to the centre of the court after making a shot. Squash can be played with different scoring systems and players in amateur matches can arbitrarily set a points total to determine a winner. Currently, most games are played according to the point-a-rally system (PARS) to 11 points although many players continue to play by English or Hand-In-Hand-Out (HiHo) scoring to 9 whereby only the server may win a point. Players often experience PARS and Hi-Ho as vastly different games requiring different tactics and player attributes. In addition to English or Hand-In-Hand-Out and PARS, there is American scoring by which games are played to 15 instead of 11 as in PARS. The original scoring system is known as English scoring, also called hand-out scoring. Under this system, if the server wins a rally, they receive a point, while if the returner wins rally, only the service changes (i.e., the ball goes "hand-out") and no point is given. The first player to reach 9 points wins the game. However, if the score reaches 8–8, the player who was first to reach 8 decides whether the game will be played to 9, as before (called "set one"), or to 10 (called "set two"). At one time this scoring system was preferred in Britain, and also among countries with traditional British ties, such as Australia, Canada, Pakistan, South Africa, India and Sri Lanka. The current official scoring system for all levels of professional and amateur squash is called point-a-rally scoring (PARS). In PARS, the winner of a rally always receives a point, regardless of whether they were the server or returner. Games are played to 11, but in contrast to English scoring, players must win by two clear points. That is, if the score reaches 10–10, play continues until one player wins by two points. PARS to 11 is now used on the men's and women's professional tour, and the tin height has been lowered by two inches (to 17 inches) for all PSA events (men's and women's). Another scoring system is American scoring. The rules of American scoring are identical to PARS, apart from games are played to 15. This system is not widely used because games were considered to last too long and the winner would usually be the fitter player, not necessarily the better player. PARS is almost universally preferred by the game's top professionals and tournaments. One of the reasons for switching to PARS was that long, taxing matches became less frequent and promotors could more easily predict match and session length. Gawain Briars, who served as the Executive Director of the Professional Squash Association (PSA) when the body decided to switch to PARS in 2004 hoped that PARS would make the "professional game more exciting to watch, [and] then more people will become involved in the game and our chances of Olympic entry may be enhanced." One of the problems with English or Hi-Ho scoring is that games often last longer as players continually win service before losing service to the other player without the score being affected. Consequently, the winner is more often than not the fitter athlete. Moreover, English or Hi-Ho scoring can encourage players to play defensively with the aim of wearing down one's opponent before winning by virtue of one's fitness. Unfortunately, such exhausting, defensive play can affect player's prospects in knock-out tournaments and does not make for riveting TV. However, many amateur players prefer the English or Hi-Ho scoring system for its added psychological and tactical dimension and because players are almost guaranteed more court time, even against fitter and better players. On the other hand, some amateurs prefer PARS as the scoreline more accurately reflects the match; in English or Hi-Ho, one player might win by 9-0 despite the opponent having repeatedly won service, but without converting that service into actual points. Playing according to English or Hi-Ho thus requires the player to cope with the added psychological pressure of first winning service, and then holding their nerve to convert service into points. 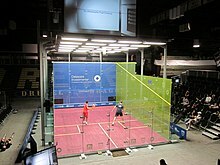 Since the World Squash Federation's (WSF) decision in 2009, almost all professional and league games have been played according to the PARS to 11. Although the Professional Squash Association had been using PARS since 2004, the WSF's decision proved controversial in the United Kingdom and Commonwealth where games were usually played according to English or Hi-Ho. When the Veterans Squash Rackets Club of Great Britain surveyed their members in 2012, they found that 80% of their members were against switching from HiHo to PARS. President Philip Ayton argued that PARS would "kill the essence of the game." Ayton was particularly concerned that the "great comebacks" that characterised English or Hi-Ho when "the player who is down in a game can still attack when in hand serving" would disappear as PARS fostered an "ultra-defensive attitude, because every rally counts the same. "Jahangir Khan has countered that PARS actually made the game far more attacking, but diminished the psychological aspect of the game: "With the nine points scoring system, matches were more mental and physical and could go longer, but now with the 11-point system, every rally counts, and even if you go behind you can still recover. That makes it a lot more attacking." Maj Madan, one the game's top referees, similarly stated that PARS had "destroyed the fitness element and, more importantly, the cerebral magic of the…game.” HIs comments were unearthed when an email chain of referees discussing the problem of shorter and shorter squash matches was leaked in 2011. A key strategy in squash is known as "dominating the T" (the intersection of the red lines near the centre of the court, shaped like the letter "T", where the player is in the best position to retrieve the opponent's next shot). Skilled players will return a shot, and then move back toward the "T" before playing the next shot. From this position, the player can quickly access any part of the court to retrieve the opponent's next shot with a minimum of movement and possibly maximising the movement required by the opponent to answer the returned shot. A common strategy is to hit the ball straight up the side walls to the back corners; this is the basic squash shot, referred to as a "rail," straight drive, wall, or "length." After hitting this shot, the player will then move to the centre of the court near the "T" to be well placed to retrieve the opponent's return. Attacking with soft or "short" shots to the front corners (referred to as "drop shots") causes the opponent to cover more of the court and may result in an outright winner. Boasts or angle shots are deliberately struck off one of the side walls before the ball reaches the front. They are used for deception and again to cause the opponent to cover more of the court. Rear wall shots float to the front either straight or diagonally drawing the opponent to the front. Advantageous tactical shots are available in response to a weak return by the opponent if stretched, the majority of the court being free to the striker. Ability to change the direction of ball at the last instant is also a tactic used to unbalance the opponent. Expert players can anticipate the opponent's shot a few tenths of a second before the average player, giving them a chance to react sooner. Power players: powerful shots to take time away from their opponent. For example, John White, Omar Mosaad, Mohammed Sadiq. Shot makers: accurate shots to take time away from their opponent. For example, Jonathon Power, Ramy Ashour, Amr Shabana, James Willstrop. Retrievers: excellent retrieval to counter power and accuracy and to return shots more quickly to take time away from their opponent. For example, Peter Nicol, Grégory Gaultier, Nicol David. Attritional players: a consistently high-paced game both from shot speed and running speed to wear their opponent down over time. For example, David Palmer, Nick Matthew, Jansher Khan, Jahangir Khan. Interference and obstruction are an inevitable aspect of this sport, since two players are confined within a shared space. Generally, the rules entitle players to a direct straight line access to the ball, room for a reasonable swing and an unobstructed shot to any part of the front wall. When interference occurs, a player may appeal for a "let" and the referee (or the players themselves if there is no official) then interprets the extent of the interference. The referee may elect to allow a let and the players then replay the point, or award a "stroke" to the appealing player (meaning that he is declared the winner of that point) depending on the degree of interference, whether the interfering player made an adequate effort to avoid interfering, and whether the player interfered with was likely to have hit a winning shot had the interference not occurred. An exception to all of this occurs when the interfering player is directly in the path of the other player's swing, effectively preventing the swing, in which case a stroke is always awarded. When it is deemed that there has been little or no interference, or that it is impossible to say one way or the other, the rules provide that no let is to be allowed, in the interests of continuity of play and the discouraging of spurious appeals for lets. Because of the subjectivity in interpreting the nature and magnitude of interference, the awarding (or withholding) of lets and strokes is often controversial. When a player's shot hits their opponent prior to hitting the front wall, interference has occurred. If the ball was travelling towards the side wall when it hit the opponent, or if it had already hit the side wall and was travelling directly to the front wall, it is usually a let. However, it is a stroke to the player who hit the ball if the ball was travelling straight to the front wall when the ball hit the opponent, without having first hit the side wall. Generally after a player has been hit by the ball, both players stand still; if the struck player is standing directly in front of the player who hit the ball he loses the stroke, if he is not straight in front, a let is played. If it is deemed that the player who is striking the ball is deliberately trying to hit his opponent, he will lose the stroke. An exception to all of this occurs when the player hitting the ball has "turned", i.e., let the ball pass him on one side, but then hit it on the other side as it came off the back wall. In these cases, the stroke goes to the player who was hit by the ball. The referee is usually a certified position issued by the club or assigned squash league. The referee has dominant power over the squash players. Any conflict or interference is dealt with by the referee. The referee may also issue to take away points or games due to improper etiquette regarding conduct or rules. Refer to “Interference and Obstruction” for more detail. In addition the referee is usually responsible for the scoring of games. Nowadays, three referees are usually used in professional tournaments. The Central referee has responsibility to call the score and make decisions with the two side referees. There are several variations of squash played across the world. In the U.S. hardball singles and doubles are played with a much harder ball and different size courts (as noted above). Hardball singles has lost much of its popularity in North America (in favour of the International version), but the hardball doubles game is still active. There is also a doubles version of squash played with the standard ball, sometimes on a wider court, and a more tennis-like variation known as squash tennis. The relatively small court and low-bouncing ball makes scoring points harder and rallies usually longer than in its American cousin, racketball, as the ball may be played to all four corners of the court. Since every ball must strike the front wall above the tin (unlike racketball), the ball cannot be easily "killed". Another difference between squash and racketball is the service game. Racketball allows for the entire back court (from 20-feet to 40-feet) to be used as a service return area; this makes returning serves much more challenging in racketball than squash. Racketball serves routinely exceed 140 mph (225 km/h) and are a crucial component of the game, similar to tennis. Squash provides an excellent cardiovascular workout. Players can expend approximately 600 to 1,000 food calories (3,000 to 4,000 kJ) every hour playing squash according to English or Hi-Ho scoring. The sport also provides a good upper and lower body workout by exercising both the legs in running around the court and the arms and torso in swinging the racket. In 2003, Forbes rated squash as the number one healthiest sport to play. However, some studies have implicated squash as a cause of possible fatal cardiac arrhythmia and argued that squash is an inappropriate form of exercise for older men with heart disease. According to the World Squash Federation, as of June 2009, there were 49,908 squash courts in the world, with 188 countries and territories having at least one court. England had the greatest number at 8,500. The other countries with more than 1,000 courts, in descending order by number were Germany, Egypt, the United States of America, Australia, South Africa, Canada, Malaysia, France, the Netherlands, and Spain. Today, The United States has the fastest growing squash participation. There are an estimated 20 million squash players worldwide. In June 2009, there were players from nineteen countries in the top fifty of the men's world rankings, with England and Egypt leading with eleven each. The women's world rankings featured players from sixteen countries, led by England with eleven. The men's and women's Professional Squash Association tour, men's rankings and women's rankings are run by the Professional Squash Association (PSA). The Professional Squash Tour is a tour based in the United States. Squash has been featured regularly at the multi-sport events of the Commonwealth Games and Asian Games since 1998. Squash is also a regular sport at the Pan American Games since 1995. Squash players and associations have lobbied for many years for the sport to be accepted into the Olympic Games, with no success to date. Squash narrowly missed being instated for the 2012 London Games and the 2016 Rio de Janeiro Games (missed out again as the IOC assembly decided to add golf and rugby sevens to the Olympic programme). Squash also missed out as an event in the 2020 Olympic Games. At the 125th IOC Session in Buenos Aires, the IOC voted for Wrestling instead of Squash or Baseball/Softball. The usual reason cited for the failure of the sport to be adopted for Olympic competition is the difficulty of spectators to follow the action, especially via television. Squash was accepted as a demonstration sport for the 2018 Summer Youth Olympics. The World Squash Federation hopes that this inclusion will create a strong bid for a potential inclusion at the 2024 Summer Olympics. Nicol David; widely regarded as the most successful Malaysian squash player ever. The (British) Squash Rackets Association (now known as England Squash) conducted its first British Open championship for men in December 1930, using a "challenge" system. Charles Read was designated champion in 1930, but was beaten in home and away matches by Don Butcher, who was then recorded as the champion for 1931. The championship continues to this day, but has been conducted with a "knockout" format since 1947. Jahangir Khan of Pakistan is widely considered to be the greatest player in the history of the game. The women's championship started in 1921, and has been dominated by relatively few players: Joyce Cave, Nancy Cave, Cecily Fenwick (England) in the 1920s; Margot Lumb & Susan Noel (England) 1930s; Janet Morgan (England) 1950s; Heather McKay (Australia) 1960s and 1970s; Vicki Cardwell (Australia) and Susan Devoy (New Zealand) 1980s; Michelle Martin and Sarah Fitz-Gerald (Australia) 1990s and Nicol David (Malaysia) 2000s. The Men's British Open has similarly been dominated by relatively few players: F.D. Amr Bey (Egypt) in the 1930s; Mahmoud Karim (Egypt) in the 1940s; brothers Hashim Khan and Azam Khan (Pakistan) in the 1950s and 1960s; Jonah Barrington (Great Britain and Ireland) and Geoff Hunt (Australia) in the 1960s and 1970s, Jahangir Khan (Pakistan) 1980s ; Jansher Khan (Pakistan) in the 1990s and more recently, David Palmer and Nick Matthew. The World Open professional championship was inaugurated in 1976 and serves as the main competition today. Jansher Khan holds the record of winning eight World titles followed by Jahangir Khan with six, Geoff Hunt & Amr Shabana four, Nick Matthew & Ramy Ashour three. The women's record is held by Nicol David with eight wins followed by Sarah Fitzgerald five, Susan Devoy four, and Michelle Martin three. Heather McKay remained undefeated in competitive matches for 19 years (between 1962 and 1981) and won sixteen consecutive British Open titles between 1962 and 1977. Previous world number one Peter Nicol stated that he believed squash had a "very realistic chance" of being added to the list of Olympic sports for the 2016 Olympic Games, but it ultimately lost out to golf and rugby sevens. The Professional Squash Association (PSA) publishes monthly rankings of professional players: Dunlop PSA World Rankings. ^ a b Zug, James. "History of Squash". US Squash. Archived from the original on 17 July 2011. Retrieved 17 January 2011. ^ a b "Grays of Cambridge: History" Archived 2011-07-06 at the Wayback Machine - makers of rackets and founded in 1855 by Henry John Gray, the Champion rackets Player of England. "In those days, the rackets were made from one piece English ash, with a suede leather grip and natural gut. ... The 1980s witnessed a period of re-structuring and consolidation. The Cambridge rackets factory was forced to close in face of the move to graphite rackets, and production was moved to the Far East." ^ "Squash Balls". Squashplayer.co.uk. Retrieved 2009-06-03. ^ "Sports, For Parents, Teachers and Coaches, National Eye Institute [NEI]". Nei.nih.gov. Archived from the original on 2013-04-27. Retrieved 2013-04-18. ^ "Squash : Nick Matthew v James Wilstrop : 2011 Delaware Investments U.S. Squash Open". YouTube. 2012-02-12. Retrieved 2013-04-18. ^ "Squash : Nick Matthew v James Wilstrop : 2011 Delaware Investments U.S. Open Squash". YouTube. Retrieved 2013-04-18. ^ "Squash Court Construction: "How to build a Court?" - ASB SquashCourt". asbsquash.com. Retrieved 2017-04-25. ^ "Frequently asked questions on squash - general squash tips". squashclub.org. ^ "New Scoring System". www.squashplayer.co.uk. Retrieved 2019-01-04. ^ Gilmour, Rod (2012-06-13). "Squash scoring changes will 'kill essence of the game', say top British veterans". ISSN 0307-1235. Retrieved 2019-01-04. ^ "Will's World The Referees' Call | Squash Magazine". squashmagazine.ussquash.com. Retrieved 2019-01-04. ^ "Agility Training: Improving Sporting Reaction Times". Pponline.co.uk. Archived from the original on 2013-05-05. Retrieved 2013-04-18. ^ Strategies, Jonathon Power Exposed DVD 2. ^ a b "Santelmann, N. 2003. Ten Healthiest Sports". Forbes.com. 2003-09-30. Retrieved 2012-02-26. ^ "Dan Ackman, "Egyptians Have Cornered the Squash Racket"". The Wall Street Journal, October 3, 2007. 3 October 2007. ^ "Professional Squash Tour". Prosquashtour.net. Retrieved 2013-04-18. ^ "Golf & rugby voted into Olympics". BBC.co.uk. October 9, 2009. Retrieved 2 March 2010. ^ "Squash Leads on 'Innovation' in Bid Presentation". World Squash Federation. ^ "Buenos Aires 2018 take Youth Olympic Games to the next level with Squash". World Squash Federation. 6 July 2017. Retrieved 14 March 2018. ^ "Squash Favourite for 2024 Olympic Games inclusion". squash.org.au. Retrieved 10 October 2018. ^ "Greatest player". Squashsite. Retrieved 2 March 2010. ^ a b "Championship records". Allam British Open Squash. ^ "Squash NSW History". Squash Australia. Retrieved 11 March 2015. ^ Slater, Matt (2007-03-23). "Squash 'deserves Olympic place', BBC article". BBC News. Retrieved 2012-02-26. ^ "Current PSA World Rankings". psaworldtour.com. PSA World Tour, Inc.
Bellamy, Rex (1978). The Story of Squash. Cassell Ltd, London. ISBN 0-304-29766-6. Palmer, Michael (1984). Guinness Book of Squash. Guinness Superlatives Ltd, London. ISBN 0-85112-270-1. "Rules of Squash". ussquash.com. US Squash. 25 September 2008. Retrieved 10 October 2018. "squash a glimpse of its colorful history". winningsquash.com. winning squash. 17 March 2019. Retrieved 25 March 2019. Satterthwaite, Frank (1979). The three-wall nick and other angles: a squash autobiography. New York: Holt, Rinehart, and Winston. ISBN 0-03-016666-7. Zug, James; Plimpton, George (2003). Squash: a history of the game. New York: Scribner. ISBN 0-7432-2990-8.